The Verge posted up a very detailed article about the state of the gaming industry. A lot of information regarding AAA games points to something many core gamers are hoping will happen: Mainstream AAA games from top tier publishers will result in a crash. This is mainly because the biggest issue in the gaming industry is that it has nothing to do with video games, but instead bottom lines. According to Russ Pitts from The Verge's Polygon, he starts connecting the dots with what a lot of core gamers have been clamoring on about for a while: the AAA video game market cannot and is not sustaining itself. Sales are down for each month compared to the past few years, obviously due to less-than-stellar releases and a piss poor economy. Nevertheless, games still cost far less to produce than the average Hollywood movie and AAA titles are labeled as such once the production budget hits $20 million or higher. However, according to Polygon's article, this is starting to take a toll on the likes of companies such as Activision-Blizzard, Electronic Arts and THQ. The latter of which is reeling at the moment. You don't really need to be a financial expert to know that EA is punch-drunk in both public image and their market value. And while Mass Effect 3 managed to sell more than 3 million copies their executives still didn't consider it to be enough. There was also the long-rumored belief that the higher-ups also weren't very pleased with the numbers for Star Wars: The Old Republic, which eventually turned out to be true. The last bit is Dead Space 3, which EA claimed needs to sell 5 million for the franchise to continue to be viable. But enough on EA's front, there's also Activision who competes with EA when it comes to mass marketing AAA games, spending up to $100 million to promote games like Call of Duty. Oftentimes all this over-promotion doesn't actually pay off and we end up with moderate-selling games like Prototype 2, which looked all right but not really worth $60 as a price of entry, which actually caused Radical Entertainment to go bust. 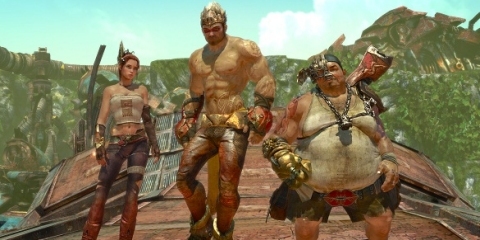 And then there are games like Enslaved: Odyssey to the West, which barely moved 75,000 copies out of the gate even with a Metacritic score of 81, as reported by the Guardian. Then we have games like Neverdead, Spec Ops: The Line, Knights Contract and a dozen and one other generic Hollywood-wannabe AAA blockbuster games that come and go and barely do much to boost profits for the company. We have also seen plenty of this during the lackluster E3 2012 tradeshow, which was basically a lot of executives on stage trying to sell us games we've played a thousand and one times already. It's also quite obvious that not all of those AAA titles at E3 will go on to sell big numbers...some will flop, some are guaranteed to flop. The article at Verge also coincides with what Vivendi Universal is trying to do: Get out of the mainstream AAA electronic entertainment sector before it goes belly up. Vivendi is trying to sell Activision-Blizzard for $8.1 billion because they don't see anymore growth from the division. It's true, Activision has milked as much as they can with little to no innovation and stagnation is starting to kick in with falling World of Warcraft numbers and telling signs of a slight drop in year-to-year sales for Call of Duty. There are a few things that the article gets wrong, though, and it's that the AAA market can't take hold in the PC arena because 90% of gamers pirate PC games, which was actually discussed in an article we ran here last year. But the data was inconclusive to even suggest that such a number was accurate or relative to affecting PC game sales, and it's become officially apparent that the PC market is highly profitable given that in 2011 the PC games market racked in $18 billion which was just a few billion shy from the entire home console market. Steam is currently leading the way in digital PC sales, and according to Forbes has an estimated worth at $3 billion dollars. But the real catch is that many of the PC games appeal to niche core gamers and the sales are reflective of the community's desire to play a variety of specific games rather than an attachment to demographic market data that dictates what gamers play on their consoles. In other words, a majority of PC gamers put money into games they think are fun, not necessarily because it had a $50 million dollar budget or a $100 million dollar marketing campaign. The other problem with Polygon's article is that they fall into the trap of thinking that the fall of the AAA market directly ties into the emerging mobile market, especially thinking that this is a lucrative alternative. Publishers are making the same mistakes thinking that because millions of people have mobile phones that such a scenario instantaneously creates millions of potential gamers. In reality, only a few mobile games out of the thousands that flood the market are actually highly profitable, and sales data from PricewaterhouseCooper from last year as well as forecasts for the next few years indicate that the mobile market's revenue is far too small to cannibalize the home console or gaming PC market, and the revenue is also too small to compensate for what a publisher would lose by abandoning the home console market for a mobile only venture. But in the end, what does this mean? It means that the AAA mainstream market is losing some of its "flash in the pan" panache. It also means that many gamers see that the AAA market is composed of factory-made blockbusters and not necessarily creatively made video games. Even Ubisoft's own creative director for Assassin's Creed 3, Alex Hutchinson, acquiesced that the AAA market is on the verge of imploding and labeled them as a cancerous growth. In some ways, these games keep getting bigger without actually getting better. The Verge's Polygon article points to consumers having to eat the cost "margins" at some point, and that things will change where smaller experiences will sell for higher prices, similar to what Crytek's CEO Cevat Yerli mentioned in an interview with CVG, where he says all games will eventually be free-to-play, or rather, pay-to-win or pay-to-progress. I think I'm more of the pessimistic core gamer, where I'm hoping all the old, tired, executive-ran gaming publishers will burn and fade to dust, and the real talent of the gaming industry -- developers who actually have a clue -- will emerge and re-invent gaming once more. Regardless, the gaming industry is still growing hand-over-foot and getting bigger each year, it may just get to a point where it swallows up the mainstream AAA players and we'll just get stuck with a lot of cool indie titles. A gamer can dream. You can check out the full article over at The Verge.